The 2015 Hit Maker Summit has come and gone and if you missed it, well, mark your calendar for next year because a most excellent and productive time was had by all. Let’s take a brief journey. What a fantastic group this year! We had enthusiastic show creators come all the way to Orlando from Dubai, London, West Indies, and from all over the U.S.
Breakout sessions (above) were a big hit as usual. Everyone loved working with the mentors and getting expert help on their shows. Everyone came with a project they were passionate about; an eagerness to grab as much information, advice and momentum to propel it forward; a generosity of spirit and enthusiasm toward each others’ ideas; in the mood to have fun; and a serious dedication to crafting the perfect pitch. And they all seemed pretty thrilled. Tracy and her partner and husband, Steven, share a laugh… or maybe they’re giddy from jet lag since they are the ones who came in from Dubai. Everyone was engaged and diligent about getting their shows ready to pitch. Courtney Michael (left) jumped at the chance to practice his pitch and he did an amazing job! Eddie Pittman (right) shared what it was like to be a story artist on Phineas and Ferb. Former Nickelodeon V.P., Andy Bamberger, (left) gave a talk about what not to do in a pitch and sat in as a mentor at a breakout session. Mother Goose and Grimm cartoonist, Mike Peters (center), was as animated as ever and shared how the TV show based on his comic was pitched and produced. Surprise guest speaker, Ben Mandell (center), President of the Home Channel, gave us the inside scoop on how he landed the top job at the fledgling network. Wayne Carter (center), WGA writer, explained how to make the characters in your show ones that hook viewers. He was also a breakout session mentor all three days. Tracy Frenkel (right), producer and casting director led breakout sessions and kept us all laughing as the Hit Maker Summit MC. “This is absolutely my favorite event of the year because of you guys.The friendships and support that develops as we all work together. The stories we tell each other. How many times did I cry? Thanks for putting up with my tears. You all see and feel the power of emotional involvement with your projects. I certainly did. And the three days just flew by. What’s great though is how excited we are to continue working with you, and especially to see you at the conferences, where what you practiced here truly comes to life. Denyse (left) and Heather making sure everyone at the Summit had the right materials for their binders. The Hit Maker Tour is back and it’s got a new name… Pitch TV Buyers Tour. 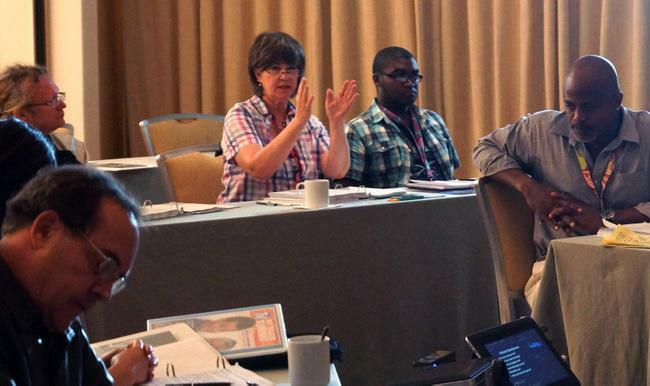 We’ll be training clients to pitch at NATPE, Realscreen and Kidscreen Summits in January and February of 2016. The Pitch TV Buyers Tour is for you, if you’ve got a TV show and you’re ready to pitch it to top media execs! And if you register by October 29th, 2015 you could SAVE $1,000 with our Early Bird discount. Pitch TV Buyers Tour is a powerful combination of virtual training sessions before and after a TV pitch conference, plus on-site mentorship at the conference including at the pitch meetings with broadcast, cable, and streaming media execs we set up for you. Click on the image below for more info. Want to know how to sell your show?